1. Chart of the Day I (above) has been featured before on CD and is worth a re-post. 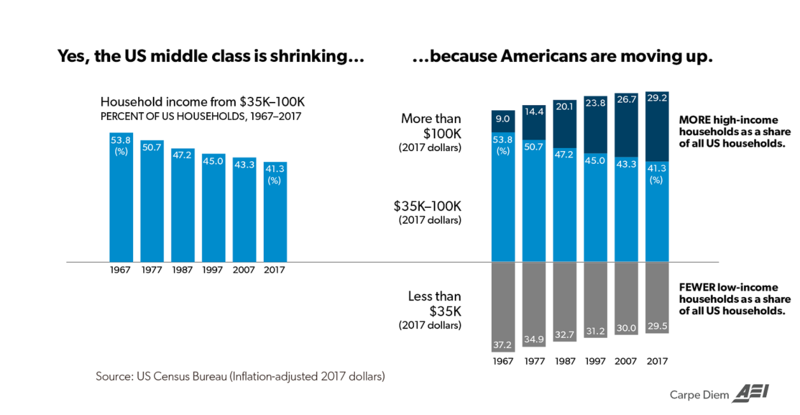 It shows that America’s middle class is disappearing but it’s because they are moving into higher income groups not moving into lower income groups. Between 1969 and 2017, the share of US households making $100,000 or more (in constant 2017 dollars) has more than tripled from 9% to 29.2%, while the share of households making $35,000 to $100,000 decreased from 53.8% to 41.3%. And the share of households making $35,000 or less decreased from 37.2% to 29.5%. 3. Markets in Everything. Family says it made $30,000 reselling Trader Joe’s seasoning online. Update: Just for Trader Joe’s spices, there are more than 300 listings on Ebay. Even during the era of slavery, most white people owned no slaves. Are their descendants supposed to pay for the descendants of those who did? Does anyone seriously suggest that blacks in America today would be better off if they were in Africa? If not, then what is the compensation for? 6. 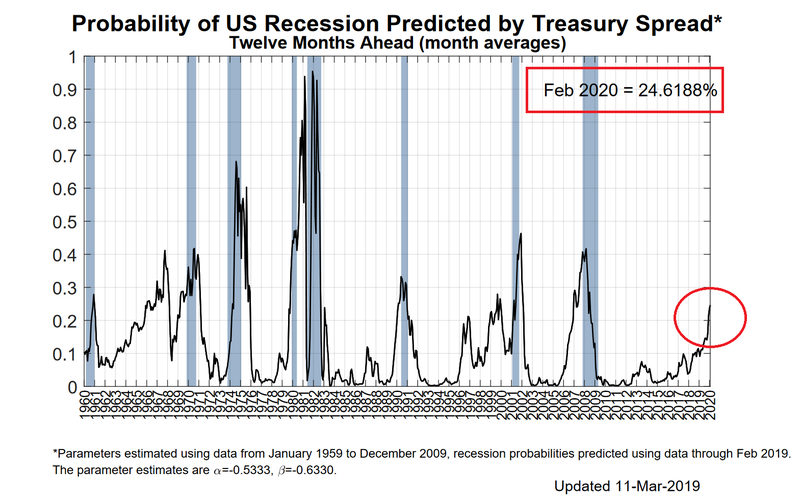 Chart of the Day III (above) shows the New York Fed’s probability of a US recession predicted by the Treasury spread (10-year T-bond rate minus the 3-month T-bill rate) 12 months ahead, which is now at 24.6%. More generally, there is no reason to take AOC seriously when she speaks about economics, whether about the social safety net or any other issue related to economics, even though she studied economics as a college student. The reason is that AOC repeatedly demonstrates a glaring lack of command not only of facts, but of basic economic principles. She demonstrated her F-grade economic literacy when tweeting about tax incentives and her opposition to Amazon’s attempt to establish offices in Long Island City. She subsequently claimed, “If we’re willing to give away $3 billion for this deal, we could invest those $3 billion in our district ourselves if we wanted to,” as if the $3 billion were a giveaway from funds already available in the tax coffers, rather than “$3 billion that would go back in tax incentives…only after we were getting the jobs and getting the revenue,” as New York City mayor Bill de Blasio (and fellow progressive) explained during an interview with NBC’s Meet the Press. 9. Facts of the Day. Fully 43% of the people on the Forbes annual list of the 400 richest Americans in 2018 were not on it 10 years ago, and 20% of people on the Forbes list grew up poor. In short, college admissions turned into a liberal-progressive black box, which no one but its creators understood. This is the heart of the Asian-American students’ complaint in their lawsuit challenging Harvard’s admissions criteria. College admissions, with myriad constituencies, is no longer based on any commonly recognizable norms or standards. What weight does the system assign to merit as historically understood? A lot? Not much? Who knows? As the lawsuit against Harvard makes clear, the universities aren’t about to climb down voluntarily from what they have become. They’re determined to be purveyors of a never-defined model of social justice, no matter how much inevitable cynicism it breeds among parents, professors and increasingly students. The college-admissions scandal is a cautionary tale about the risks of allowing a system or society to believe that traditional standards such as earned merit can be set aside without incurring costs. 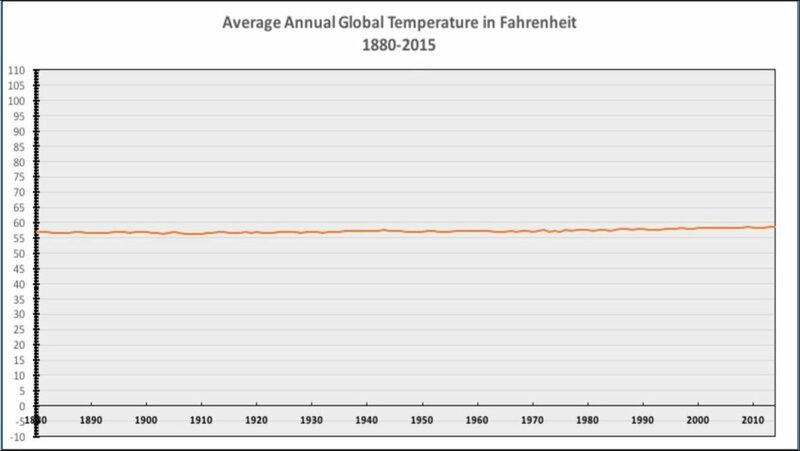 The costs are evident: confusion that degrades into cynicism and worse.